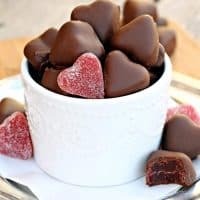 CHOCOLATE COVERED GUMDROP HEARTS — Store-bought gumdrop hearts are covered in chocolate for a quick and easy Valentine’s Day treat. If you’re looking for a last-minute Valentine’s Day treat with a homemade touch, I’ve got you covered with these Chocolate Covered Gumdrop Hearts. 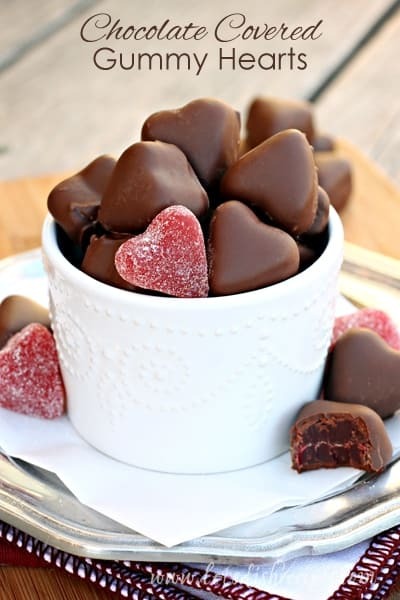 All it takes is a bit of melted chocolate to turn heart-shaped gumdrops into something extra special! And these Chocolate Covered Gumdrop Hearts are a huge hit with both kids and adults. They’re fun enough for the younger crowd to share with friends, but fancy enough for the grown ups to share with someone special. And best of all, they’re so easy. In fact, I almost hesitate to call this a recipe. It’s really more of an idea. But it’s a darn tasty idea. When we lived in Canada, we used to buy a chocolate bar called Big Turk. These taste a lot like that. If you don’t know what I’m talking about, just trust me. They’re amazing! 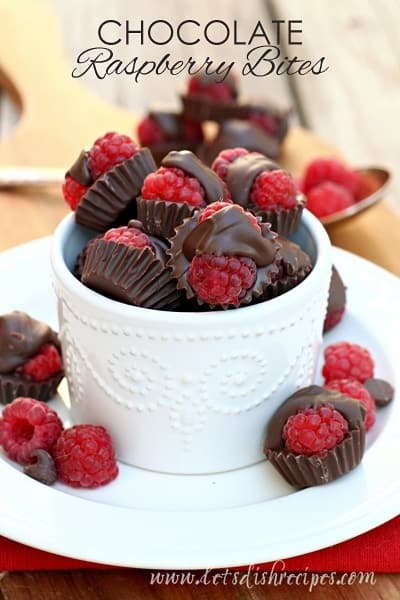 Just like these delicious chocolate covered gumdrops! Be sure to save this Chocolate Covered Gumdrop Hearts recipe to your favorite Pinterest board for later. Store-bought gumdrop hearts are covered in chocolate for a quick and easy Valentine's Day treat. In a small bowl, melt the chocolate according to package directions. Dip the gumdrops, one at a time, into the chocolate with a fork. 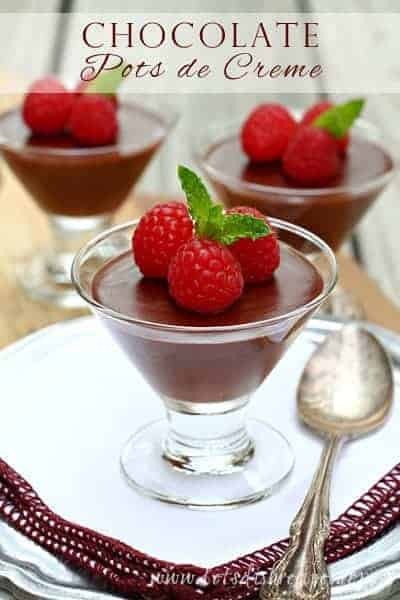 Rest the gumdrop on the tines of the fork and gently tap it against the side of the bowl to shake off any excess chocolate. Carefully slide the gumdrop onto waxed paper to set. These gumdrop hearts are just SO beautiful! I definitely wish I was receiving these for Valentine’s.